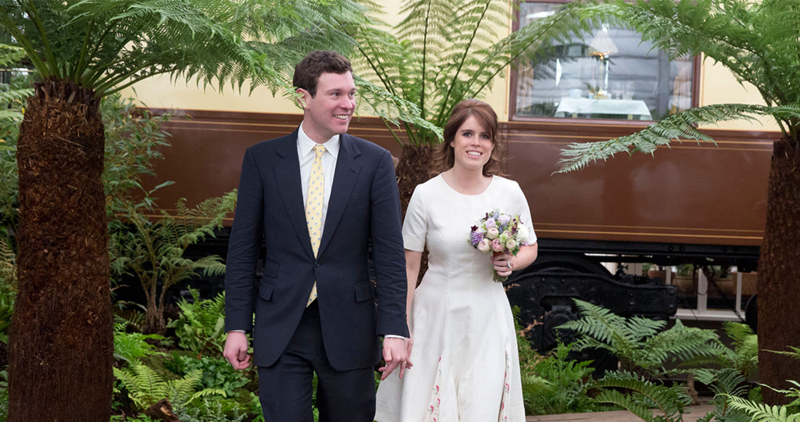 With just a few days away from the second royal wedding of the year, more details have been revealed about Princess Eugenie and Jack Brooksbank's nuptials—although the stylish royal remains tight-lipped about her wedding dress. Here’s everything we know about the ceremony, which will take place on October 12, 6am ET. After hosting the Duke and Duchess of Sussex’s wedding in May, St George’s Chapel in Windsor Castle will once again be the venue of the royal wedding. The Dean of Windsor, Rt. Revd. David Conner, will give his address and marry the couple, while Rt. Hon. John Sentamu will be leading the prayers. Celebrity florist Rob van Helden will bring the fairytale to life with fantastical blooms, and perhaps fruits and vegetables, which he is known to incorporate in his works. As for entertainment, Italian singer-songwriter Andrea Bocelli will be performing during the service, accompanied by the Royal Philharmonic Orchestra, of which the Duke of York is a patron. As with most royal weddings of late, it will be streamed live on The Royal Family's Youtube channel at 6pm, SGT. Not without its controversy—the public are protesting the security costs for the procession, which will be picked up by taxpayers—it has been confirmed that the newly weds will embark on a carriage procession through the town of Windsor, albeit a shorter one compared to the Duke and Duchess of Sussex, as they will not be riding the Long Walk. The route will take Princess Eugenie and Jack across the ground of Windsor Castle, into the town at Castle Hill, back to the castle grounds at Cambridge Gate. The best spots to catch the couple? At Castle Hill, or by Windsor Town Centre. As speculated earlier, the well-connected couple is likely to be joined by their celebrity friends. It has been revealed that Mr and Mrs Brooksbank have invited 850 guests to their ceremony, so we can expect a gathering of stars and personalities. The Royal family, as well as the couple's famous friends will be in attendance. Furthermore, they have also invited 1,200 members of the public to participate in the festivities in Windsor—selected from more than 100,000 applicants—including representatives of charities and organisations supported by the couple, and children from St George's School and Coworth Flexlands School, schools which Princess Eugenie attended. Following the procession, the Queen will host a reception at Windsor Castle for the newlyweds and their guests, spreading into the St George’s Hall, Grand Reception Room, and the Waterloo Chamber. Lady Elizabeth Anson, who is the Queen’s cousin and royal party planner will be organising the formal reception. Guests will be served champagne, canapés and wedding cake, created by bespoke cake artist Sophie Cabot. The couple will be shirking the royal tradition of fruit cake, opting instead for a red velvet and chocolate creation inspired by the rich colours of autumn. Cabot will also lend her expertise in sugar-flowers and hand-painting into the confection, adorning it in ivy—a nod towards the newlywed’s abode, Ivy Cottage in Kensington Palace. After lunch, guests are invited to Princess Eugenie’s family home at the Royal Lodge in Windsor for a formal black-tie dinner. But the festivities are just getting started. The couple is said to be extending their celebrations with a festival-themed bash on Saturday afternoon, transforming the 98-acre property into a fairground, complete with a marquee. “There will be dodgems and funfair rides, coconut shies, lots of food stalls, loads of cocktails, bloody Marys for the hangovers, and a festival vibe,” a royal source tells The Times. All the wedding festivities will reportedly be “plastic-free”, according to the eco-conscious royal, in an interview with British Vogue. Sounds slightly familiar, if you ask us. The two-day extravaganza will be orchestrated by celebrity wedding planner, Peregrine Armstrong-Jones, who counts the weddings of Victoria and David Beckham; Zara Phillips and Mike Tindall; and Autumn Kelly and Peter Phillips amongst his stellar portfolio. Fans of the royal couple can indulge in commemorative fine-bone china, produced by the Royal Collection Trust. The collection includes coasters, tankards, pillboxes, miniature teacups and saucers, emblazoned with the Princess’s initial ‘E’ and decorated with intertwining ivy, forget-me-nots, English wild bluebells and the white rose of York. The souvenirs cost between £20 to £39. Stay tuned as we round-up the most picture-perfect moments from the #royalwedding2.